Usually my January would be choked full of exams and revision, but with my final year's timetable being a bit different to previous years it's been nice to have more flexibility this January. I have been very keen to get out in the mountains for a wee while now, there's no better place to be; these past few weeks have been good for fulfilling that desire. 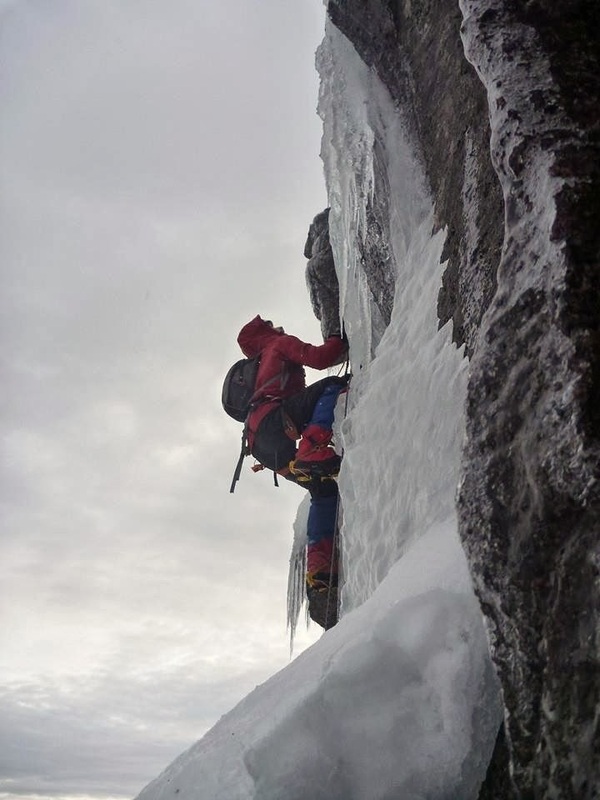 To me The Giant is the epitome of Scottish Winter climbing, an exquisite slender smear of ice that only forms under an exact sequence of freeze-thaw, a fluctuation of freezing level around 800m that would usually be considered detrimental to conditions were just perfect for the elusive route to form, but only for those that were deft enough. 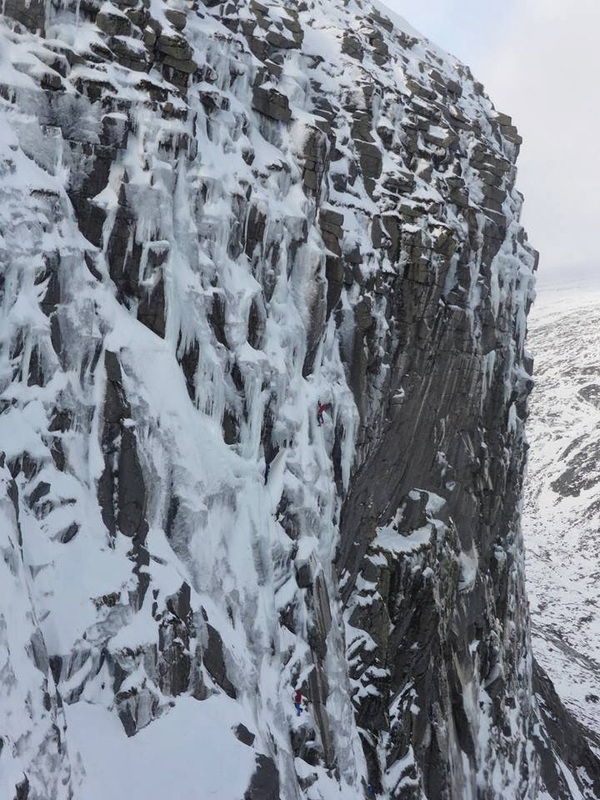 Scottish Winter climbing is a game of conditions, predicting conditions and making smart choices can really pay off; a good dose of being in the right place at the right time helps as well. In this case though, knowledge of the crag was essential and that was the driving factor; Doug and Uisdean had got it just right. As far as I am aware The Giant only formed for a week before the freezing level rose to 900/1000m and the whole of Central Gully Wall was stripped bare. Through this week it was possibly only climbable on two days, the Hawthorns made the first ascent on the first of these days on 29th December, and myself and Robin were there on the second day, on the 5th January; exactly a week after the first ascent. The route was there for the taking, but we slipped, we fumbled and we retreated, beaten by The Giant. 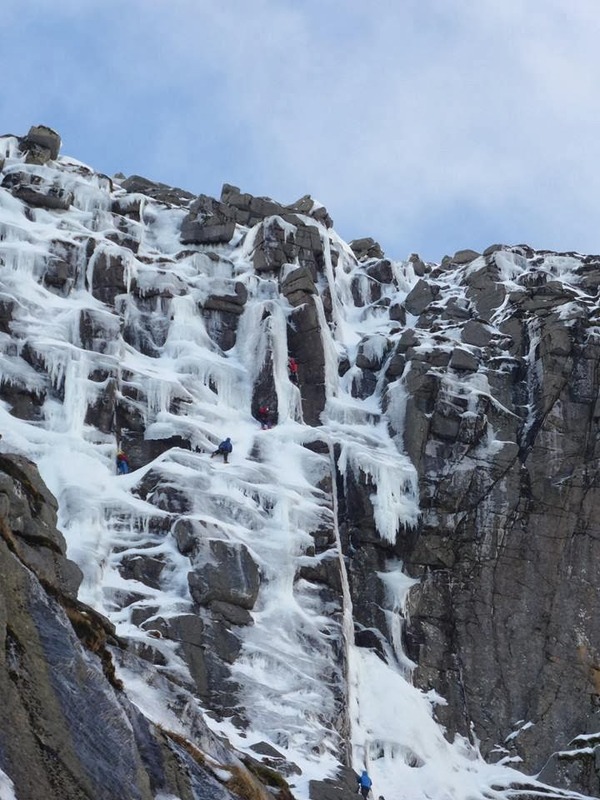 I have learnt a lot about winter climbing and about myself from it, possibly a more valuable experience than succeeding, it was the first time I've not got to the top on a winter route, it's just a shame it had to be the most iconic new route this season! Robin at the Belay at the end of first introductory pitch with the steep thin pitches looming above. First main pitch of The Giant (Photo by Robin Clothier). Crux steepness on first main pitch (Photo by Robin Clothier). Take The Throne has been well reported already so I wont say too much. Here's some of the links; Scottish Winter, Scottish Winter, Mountain Motion, UKC, Planet Mountain, Gripped. 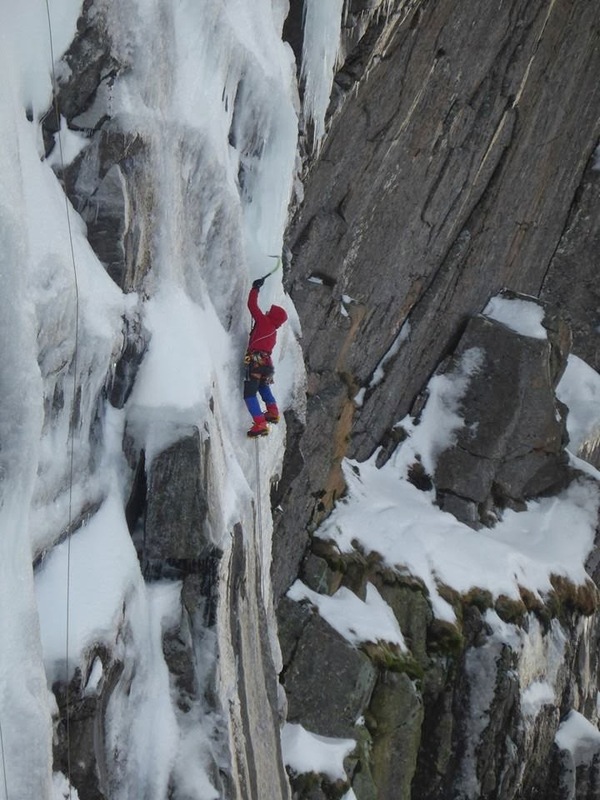 What I will say is that the second pitch was incredible; long and sustained, all on thin ice with some cruxy bulges. I placed 5 ice screws; 3 stubbys and 2 16cm screws, both of the 16cm ones were tied off - I don't know if I trust ice screws anyway, but when they're tied off I certainly don't! After about 30m of climbing, just after a crux bulge I was able to kick a small step in some neve, I had the worst hot aches in my toes I have ever experienced. I stood there for a good 10 minutes wiggling my toes and looking up at the next bulge and thin section before the belay; another 15m of climbing, I had one ice screw, and from where I was standing I couldn't see any screws below me. I knew they were there, I hoped they were still there, but I didn't want to know how far below. Thankfully the moves across to the next bulge were trivial, placing the screw one handed was hard, the moves upwards were more mentally difficult than physically strenuous. An outstanding pitch. 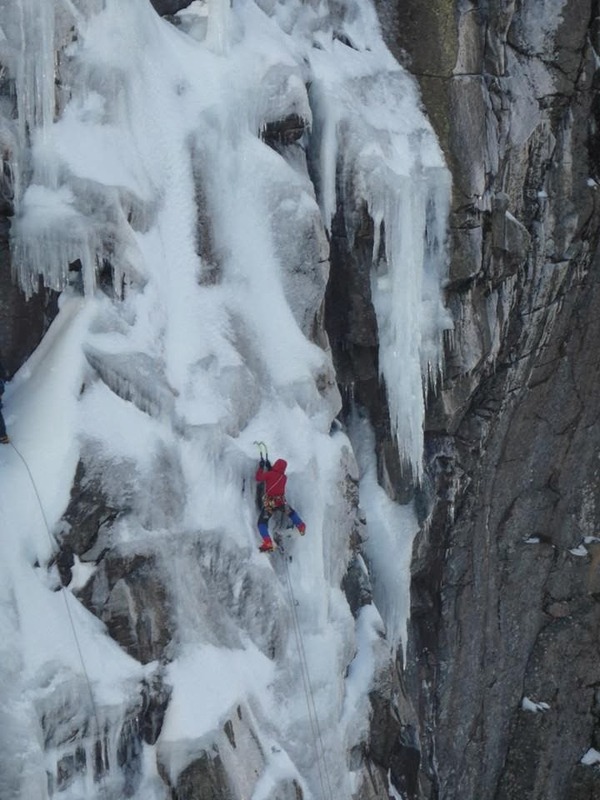 Overall, on reflection, that pitch was more of a mental battle than a physical one, not suggesting that the climbing was easy, but it felt like a "no fall zone" on many long sections of it. We took a while to decide on a name and grade, but eventually agreed on Take The Throne, VII 6. I'd give it 3 stars, but I'm maybe biased. Three superb ice pitches. 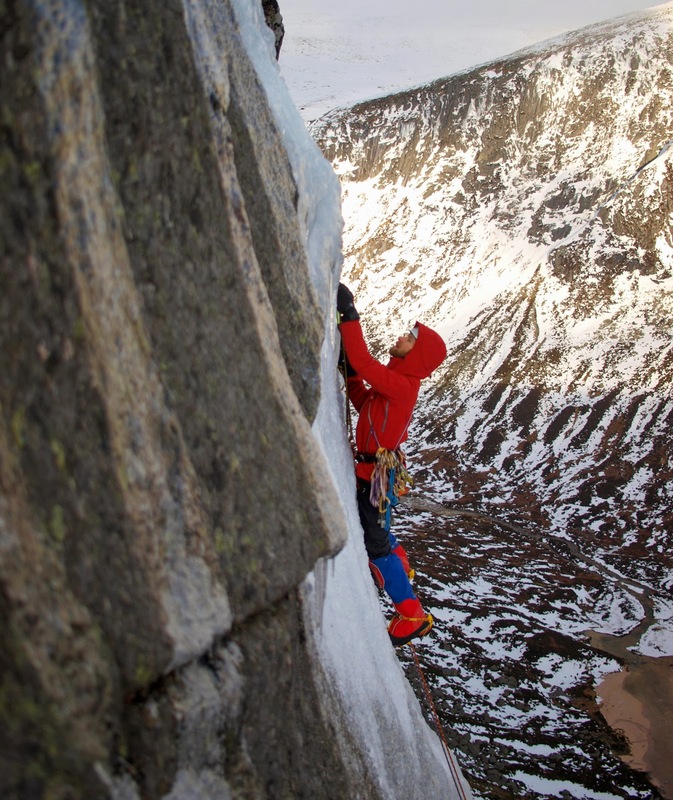 A few people have asked me what it feels like when I'm on the sharp end winter climbing, the best way to describe it might be; exhilarating, you feel so alive, an incredible mix of feelings, you definitely learn a lot about yourself; "come out of your shell, and find out who you really are". The cherry on top were the superb photos that were taken on the day, it's great to have photos of a route, especially a new route, they give a great sense of scale and perspective. Take The Throne VII 6, second pitch (Photo by Doug Hawthorn). 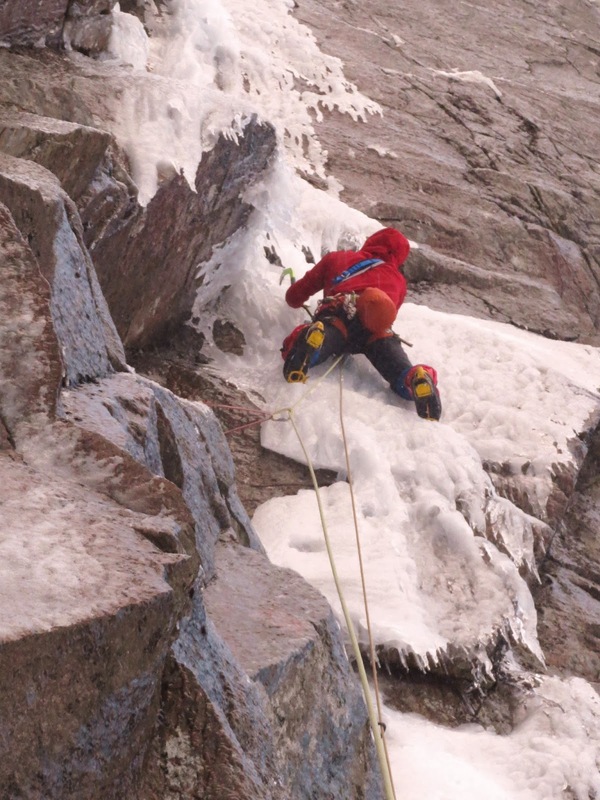 Moving up the top half of the second pitch, the icle of The Sword of Damocles to the right (Photo by Doug Hawthorn). I can be seen centre shot on the last few moves of the second pitch, Richard Bentley can be seen bottom centre on the belay of The Last Oasis (Photo by Doug Hawthorn). One of the thin sections of the second pitch (Photo by Richard Bentley). In the zone (Photo by Richard Bentley). Uisdean romping up the steep final corner, me on belay with the line of Take The Throne's long second pitch directly below. Robin Clothier in blue moving up The Last Oasis, belayed by Richard Bentley in red directly to his left (Photo by Doug Hawthorn). 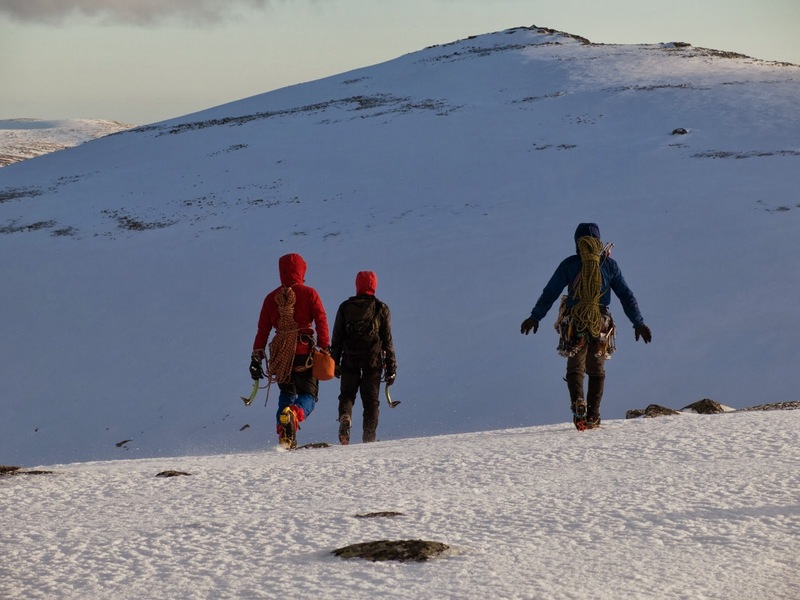 Myself, Uisdean and Iain catching some sun whilst walking off after our new routes (Photo by Simon Richardson). 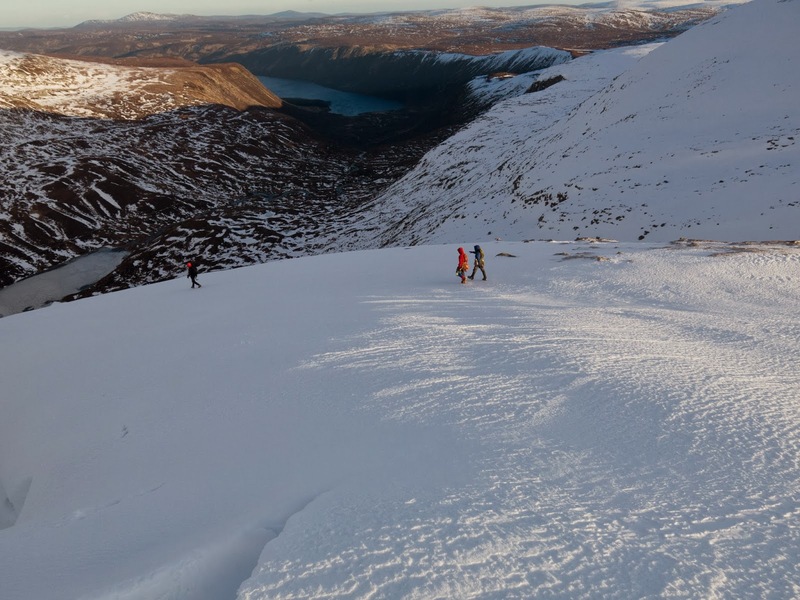 Beautiful light on the descent, an icey Dubh Loch and an almost tropical looking Loch Muick loom below us (Photo by Simon Richardson). 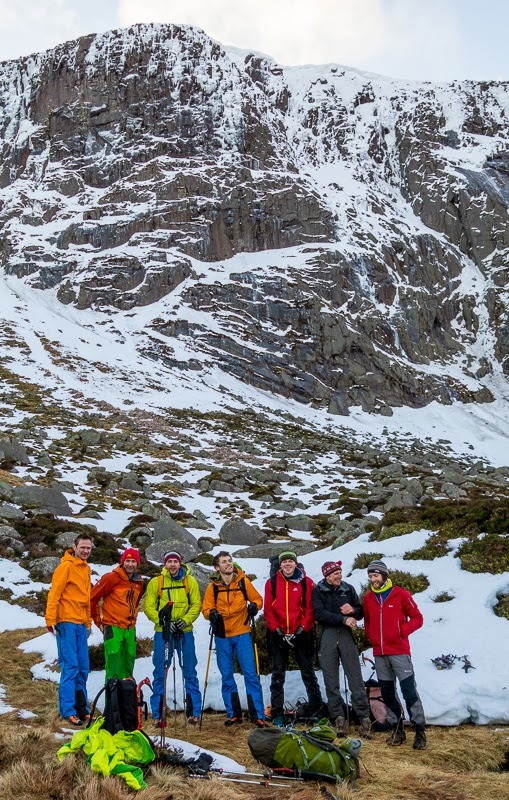 Spirits were high at Dubh Loch that day with a great crowd of guys there, a very social day. The first Ascentionists for the day. Iain Small: "We should switch places so it goes brightest to darkest" (Photo by Simon Richardson). We were back at Dubh Loch on Sunday, with lots of new routes to choose from and everything in condition we couldn't decide what to do. Iain Small and Ross Cowie were on Defence of the Realm, Richard and Robin gave The Sting a go, but detaching ice thwarted their attempt. We raced up Bower Buttress (V, 5) in two long pitches, topping out at around 11am, as we were walking back round we couldn't resist the superb line of Defence of the Realm. We did this in two long pitches as well; Uisdean taking the first and Doug taking the second, my arms were certainly happy to follow rather than lead. 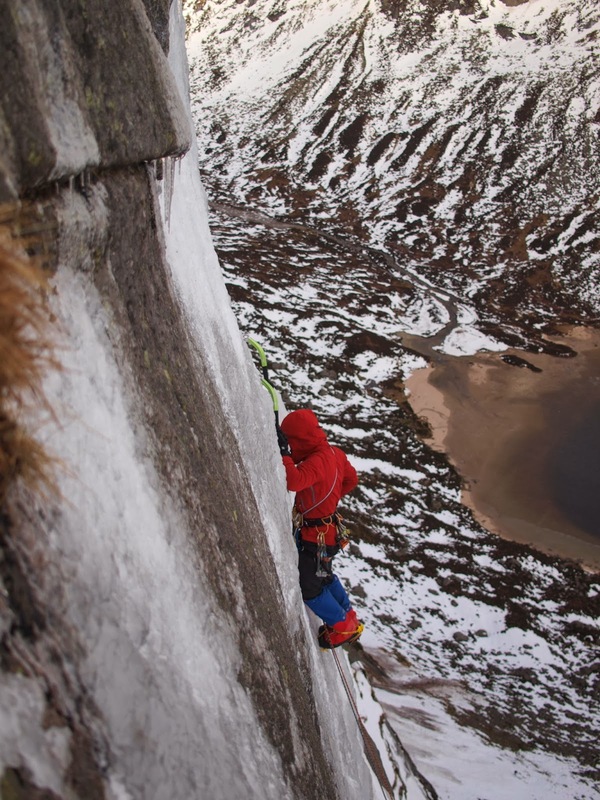 Another outstanding route at Dubh Loch and a great end to the my best weekend winter climbing yet! We jogged most of the way back down the path to the bikes and with the wind behind us cruised along Loch Muick to the car, making it just over 11 hours car to car. Sorting out our gear after topping out Bower Buttress, our first route on the Sunday, sunrise in the background (Photo by Doug Hawthorn). 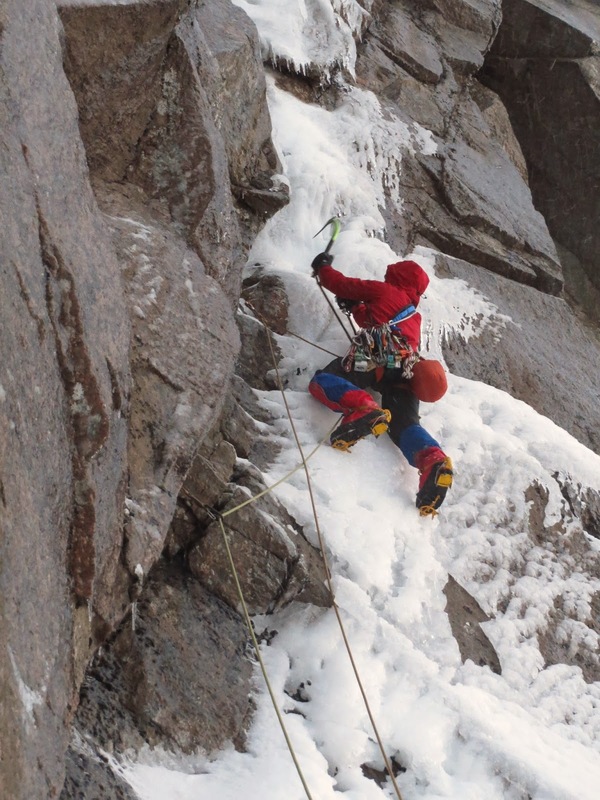 Following Doug up the steep ice of the second pitch of Defence of the Realm (Photo by Uisdean Hawthorn). 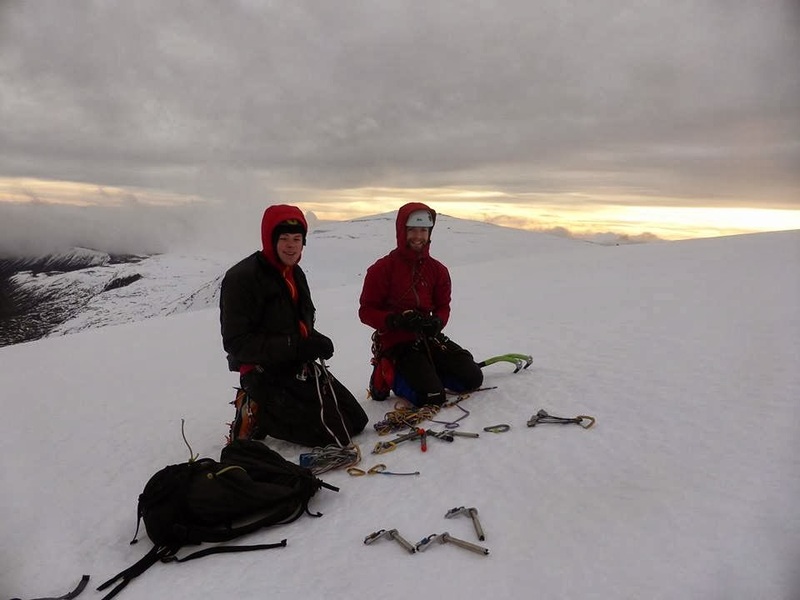 It was great to be part of such a significant weekend of winter climbing on Creag and Dubh Loch. Very psyched to continue this Dubh Loch Dream and get out there for some rock climbing this summer!